Bring! 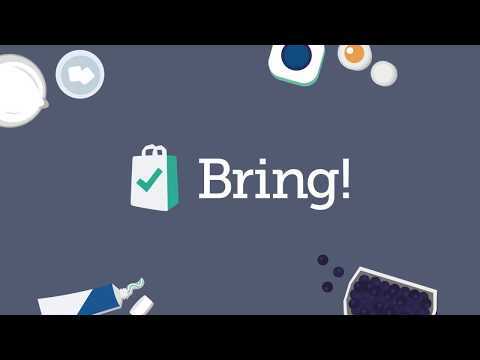 helps already over 5 million people around the world to plan and manage their grocery shopping. Thanks to the user-friendly shopping list and clever sharing functions, all people in the household are always aware of what needs to be bought. This way, you save a lot of time and money while shopping. Try it out now – it’s completely free! ★Bring! is the only shopping list honored with «Editor’s Choice» by Google Play. In addition, Bring! is recommended by Android PIT, Android Central, TechCrunch, Android Police and many more★The most important features of Bring! are:- Create and share your shopping lists with your family, colleagues or friends- Templates for all shopping lists you need – for your home, office, club or for holidays with friends- Bring! is optimized for smartphones, tablets and smartwatches- Add product photos to the items on the shopping list, so you always buy the right brand- Send clever, ready-made messages to inform your contacts that you are going shopping or have changed the list- The Bring! catalog includes several hundred articles. If something is missing, you can add articles yourself. The Bring! Shopping list can be downloaded and used free of charge. If you have feedback for us, please send an email to feedback@getbring.com.Simply clever shopping with Bring! 3.21.0:Happy Halloween!Let’s make your shopping list more beautiful. Bring! now recognises new products, finds a matching icon and puts it at the right spot for you. Try it now!If you like Bring! please tell your friends and rate us in the Play Store. Thanks.